The Peters Mountain Shelter, pictured on January 1, 1980. 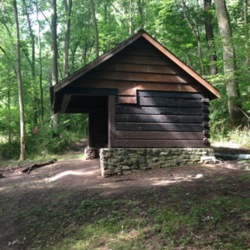 This shelter is the replacement for the Earl Shaffer Shelter, which was removed from the Trail in the summer of 2008, and now resides at the Appalachian Trail Museum in Pine Grove Furnace State Park (PA). This shelter is maintained by volunteers from the Susquehanna Appalachian Trail Club, co-founded by Earl Shaffer. 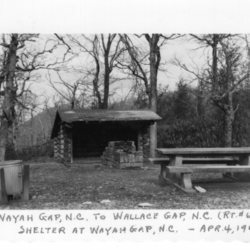 The Wayah Gap Shelter in the Nantahala Mountains, in the spring of 1961. The current shelter at this location (now known as the Wayah Shelter) is a more recent structure. 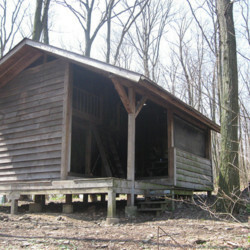 The original shelter, pictured here, is a typical three-sided log structure with a dirt floor and a fireplace in front. The trash can in the foreground was typical at many back country shelters until the 1970s, when the trash cans were removed and hikers were expected to pack out what they packed in. A hand drawn map of Wayah Bald by George Masa in 1932 offers an interesting window into the Trail in this region in its earliest days. 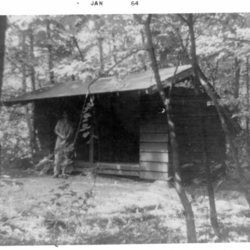 This image depicts the original version of the Wawayanda Lean-to (shelter) in New Jersey in 1955. 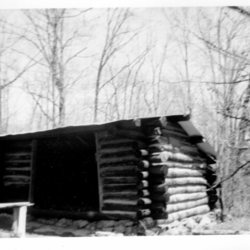 This original version of the shelter is a typical example of the three sided log and beam lean-to design that was typical of the early trail shelters. The current version of the shelter was built in 1990. 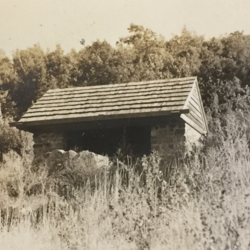 This photograph of the Walnut Mountain Shelter from 1940 depicts the original version of the shelter. 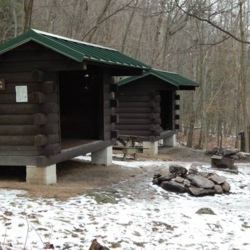 The current shelter at Walnut Mountain is a much newer structure and is maintained by the Carolina Mountain Club. 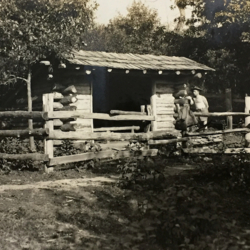 This original structure was built from chestnut logs milled nearby and is one of several early trail shelters that had log rail fences around them to keep livestock out of the structure. The Spruce Peak Shelter, pictured here in the summer of 2011, is an enclosed structure sleeping 16. It was built by the Brattleboro section of the Green Mountain Club in 1983 with logs cut and provided by U.S. Forest Service. The Spruce Peak Shelter replaced the Bromley Camp in this section of the Trail in Vermont. 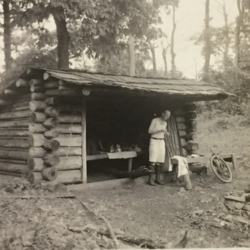 The South River Shelter, pictured here just after its completion in the summer of 1940, is one of the original trail shelters built in Shenandoah National Park by the Civilian Conservation Corps. This shelter is no longer in use as a trail shelter and instead is used as a trail maintenance storage facility by the Potomac Appalachian Trail Club, which maintains all the shelters in the Park. The Rod Hollow Shelter was constructed by volunteers from the Potomac Appalachian Trail Club in the summer of 1985. It is located several miles north of Paris, Virginia and is the last stop south of the "rollercoaster" section of the Trail in Northern Virginia (or the first shelter south for southbound hikers). 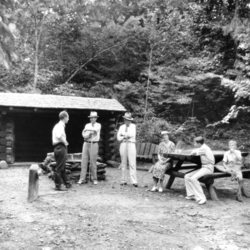 The Rocky Run Shelter in Maryland pictured here is the original shelter built in 1940 by the Civilian Conservation Corps (CCC). 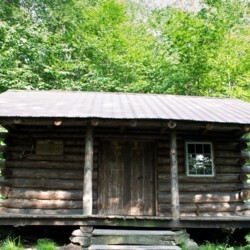 This Adirondack style log lean-to remains on the Trail but in 2008 volunteers from the Potomac Appalachian Trail Club constructed a new two story shelter. 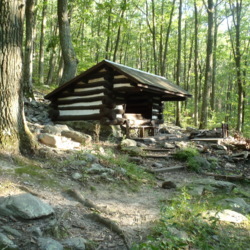 The Rocky Mountain Shelters were built by the North Chapter of the Potomac Appalachian Trail Club in 1989. The construction of these shelters, in the paired style typical of the Trail in southern Pennsylvania, was the result of a relocation of the Trail away from Route 233 during the late 1980s. That relocation meant that the old Raccoon Run Shelters were no longer needed and were thus torn down. The Rocky Run Shelters are also known for being a place where hikers may find a hand carved wooden spoon, left for them by a local provider of trail magic.